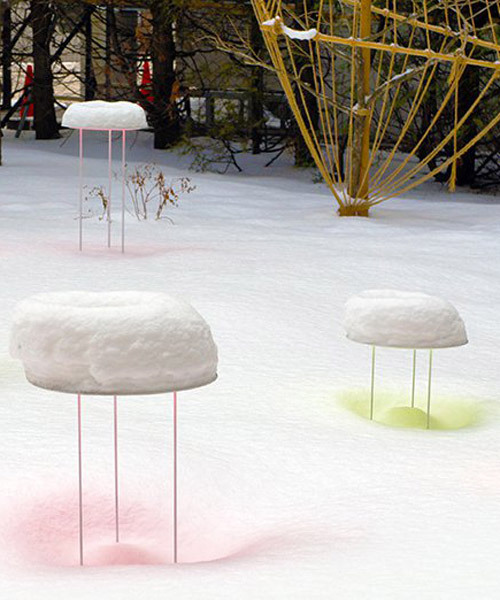 the installation sets multiple circles with holes in the center that — after a snowfall — form white piles in shape of doughnuts. toshihiko shibuya's tenth 'snow pallet' — part of a series of winter artworks — takes place in a courtyard of hotel sapporo garden palace. 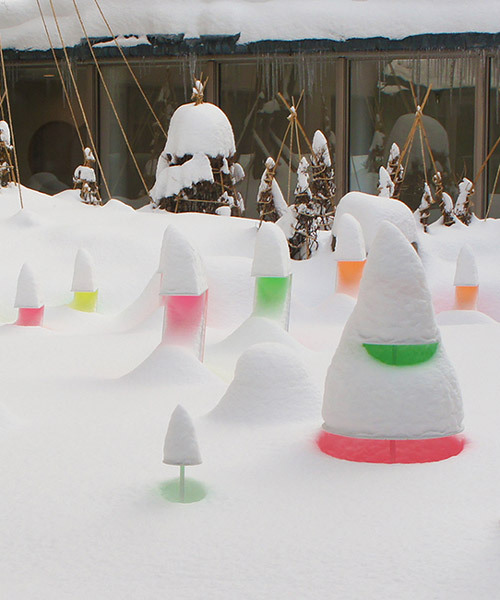 ‘snow pallet 9’ is a colorful land art piece that changes depending on snow and sunlight, offering a perpetual conversation between nature and its interventions. 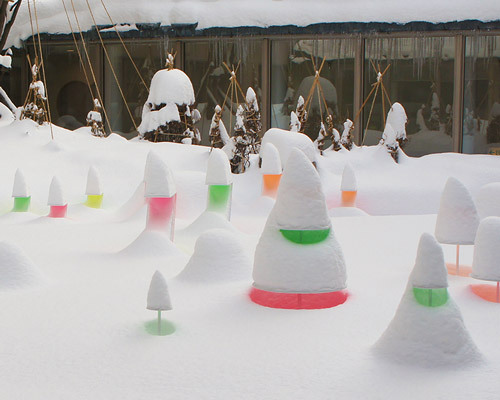 snow pallet 8 explores themes of symbiosis and coexistence between humans and nature, and seeks to express the climate unique to japan's northern regions. attached to green moss growing on trees at the park, the carpet pins cast colorful hues onto the forestscape. installed as part of the land-art work 'way to the hidden garden' by dani karavan, the white circles glide on the surface of the basin, reflecting a colorful hue. brightly hued sheets are situated behind the frosted masses, illuminating the hotel dwelling in a kaleidoscopic color palette. 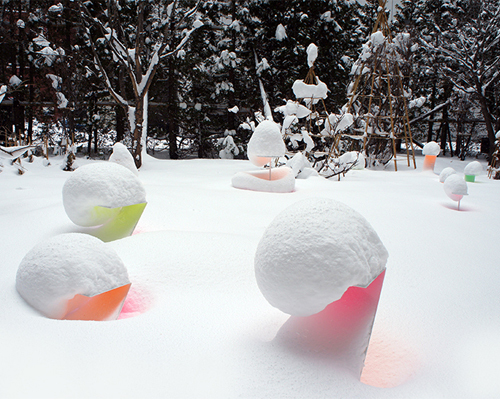 the latest in the series of environmental, winter works, the colorful art objects sit amongst the frosted terrain. 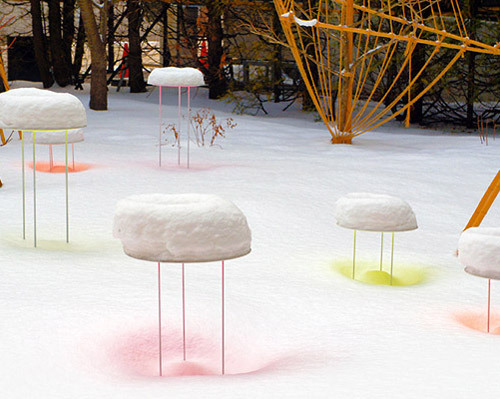 by painting iron discs in vibrantly bright hues, the colors are then cast onto the surface of the snow. 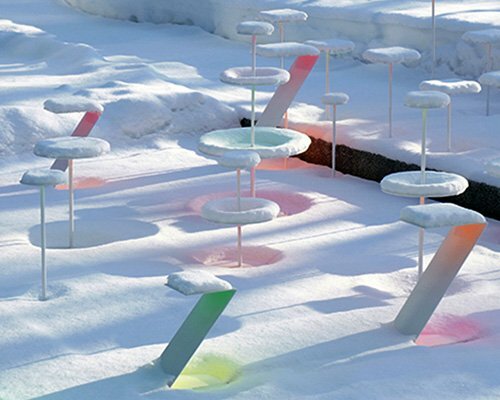 by painting iron disks in brilliantly vivid colors, the hue reflects off the surface of the snow in a hazy glow to create polychromatic smatterings across the blanketed terrain. 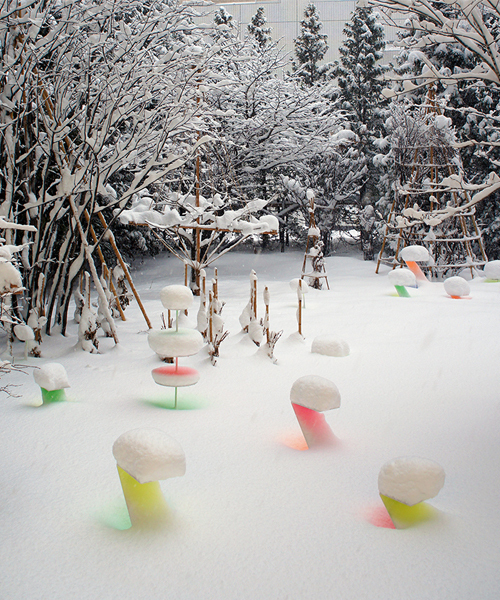 bright fluorescent disks are reflected off the white snow, as the installation constantly changes with the light and weather conditions.